Have you been tasked with developing a corporate web portal that meets diverse business requirements for your growing business? Are you responsible for coordinating dozens, hundreds, or even thousands of employees - and managing all of their schedules, project tasks, files, social conversations, contacts, and issues? Are you looking for software for maintaining an off-site solution that keeps all of your employees, schedules, and projects moving forward with the flexibility to adapt to changing needs? You may be ready to welcome the power of a private cloud solution into your business infrastructure. 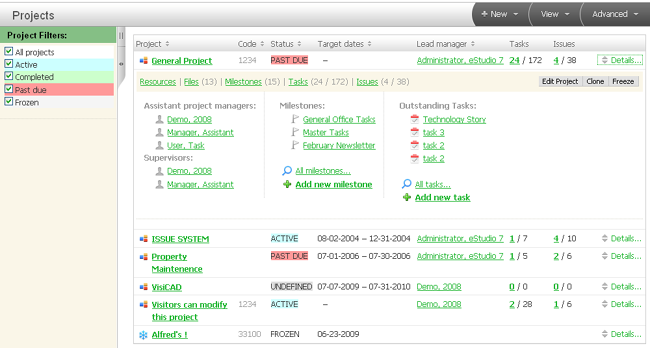 Can Same-Page help you look good while keeping all of your employees, schedules, files, and projects moving forward? Complete the brief questionnaire about your current business and IT structure. and we'll let you know if you are a good candidate for an eXtreme private cloud server. 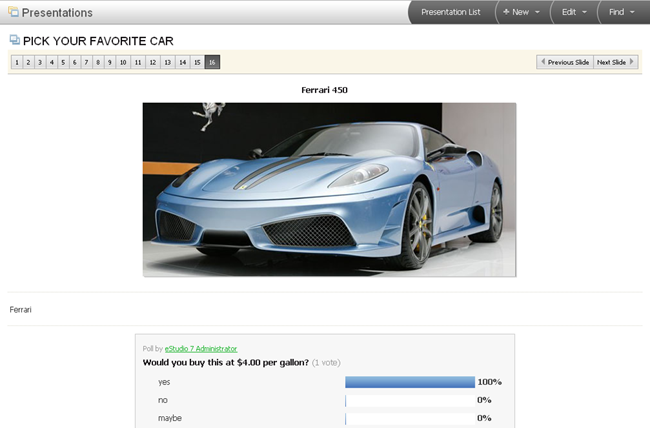 Your answers are 100% confidential and will NEVER be shared, sold, or rented to any 3rd party. eStudio eXtreme server are custom built to customer driven technical requirements. Want 128 GB of RAM and 6 TB of storage - we can do that! Every private cloud starts with a Dell server, we add software from our partners, and then install the eStudio collaboration platform tailored to your requirements without eating into your budget. There is never a license fee or a "per user" monthly fee for eStudio eXtreme. Now everybody that touches your business can access eStudio and get what they need, when they need it. eStudio is easy to launch. There is no need for special IT provisioning. Import user names, email addresses and set access rights in minutes before sending new user invitations. 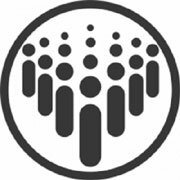 The Admin area makes it easy to remove people and grant granular group access to data. File Progress Status, Project Comments, Moderated Message Boards, and Task Activity Timelines are emailed, streamed, and sent via SMS text messages to keep you business social network up to date. We like backups so much we even keep backups of our backups. Use our secure FTP accounts for off-site storage for your "failsafe" files. Just two clicks makes a backup of each eStudio WorkSpace - all the files, comments, review notes, and logs. Customize for every brand portal, customer or community interaction with each eStudio. Create your own UIX, color schemes, add your logo, customize invitations & integrate a login form into your site. Being on your own server has its benefits. It is often possible to integrate our collaboration platform with software you already use. Do you speak API, JASON, SQL, PHP? Want to embed video clips? Link to Dropbox files? Share Calendars with Outlook? We do it all so you won't have to re-invent your business operations. 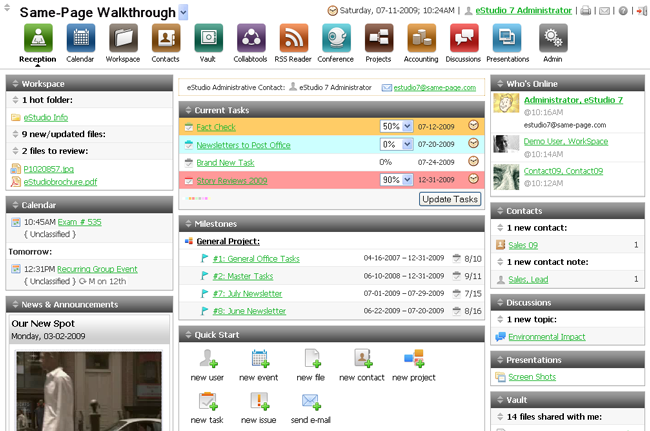 Same-Page eXtreme servers are a great solution for purpose-driven information portals (intranet substitute). Each portal can serve a different location, department, brand or work group with different collaborations tools available to each of its users. With eStudio eXtreme there is no limit to the number of portals you can create. The ROI is high because synergies of scale make for a cost-effective robust collaboration platform that everyone that touches your business can use successfully. As users log into an eStudio they are directed to any files, tasks, issues, calendar events, chats, contact notes or discussions that require their personal attention right from the portal area. eStudio is more than an intranet site. Here is a link to our complete features list. As team members log into the eStudio they are directed to any files, tasks, issues, calendar events, chats or discussions that require their personal attention. The Member Event calendar enables individuals to keep track of events and meetings that involve them. 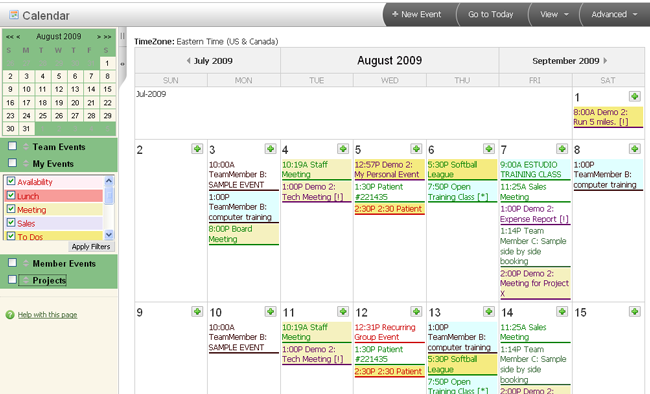 The Team Event calendar is used to broadcast events to group members, and the Supervisor calendar view enables supervisors to monitor their team's activities. Projects is where the project manager and the team members set project's objectives and goals, assign resources, manage tasks and milestones and report issues. The simple user interface provides a GANTT chart that depicts the scheduled, estimated and actual time related to each task. Keeping track of what team members are doing what helps keep everyone on the same page. Upload, share and download files. Restrict user access to folders. Choose simple or advanced upload and send email notices to users. Add comments to files so everyone is on the Same Page. Send Coworkers and Clients emails requesting them to review files. Users login to either check their approval box or create a new comment that lets everyone know that further work needs to be done. 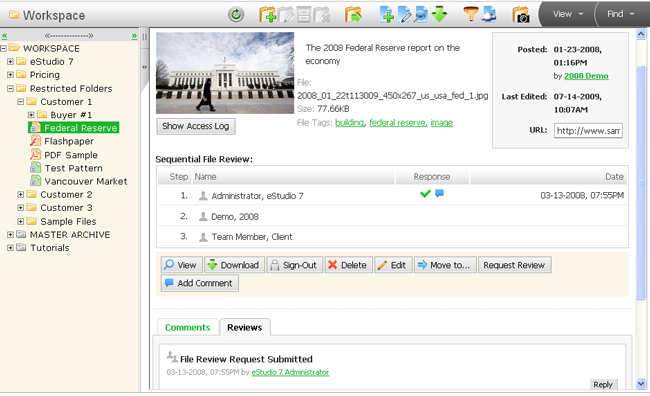 Share files with only approved users without letting other team members and clients have access. Use your own FTP (file transfer protocol) program or drag and drop your files into the Microsoft Internet Explorer window. Unlimited, live chat sessions. Schedule as session in the future or start one immediately. Invite users by eTeam and save a transcript of your meeting. Give your team unlimited discussion threads so that they can build communities of special interests. 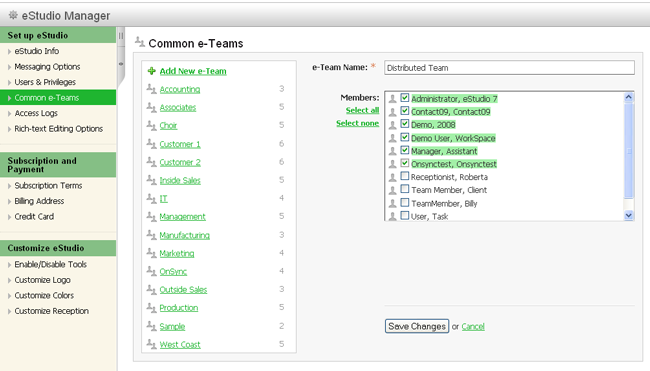 Topics are restricted by eTeams. eStudio provides a dynamic slide show system that can replace unwieldy PowerPoint presentations. Build consensus by creating mini surveys with our polling tool. 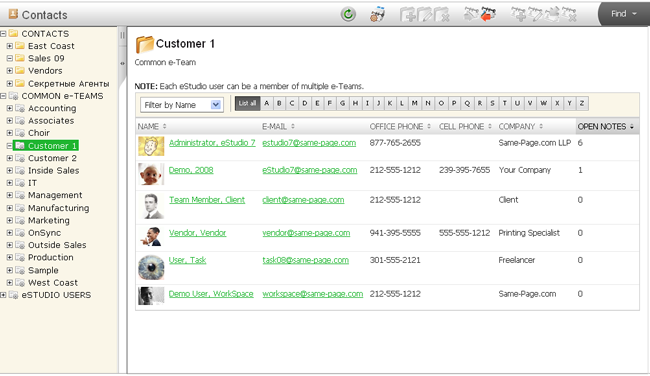 eStudio consolidates user's names, addresses, email information, phone, cell and fax numbers in one central location. eStudio's business contact management system is straight forward and secure. Limit access to folders to only specified groups of users. Insure that user teams get the proper email notifications with just a few mouse clicks. Add users, manage feature privileges, create eTeams and monitor user access to the site. You can also insert your logo, change the palette to reflect your company's colors, administer email notifications and integrate eStudio into your own Web site. Cloud collaboration software is an absolute necessity in today's business world. According to a recent report published by the Harvard Business Review, companies that fully embrace, adapt, and implement cloud-based collaboration tools and technologies have a distinct competitive advantage over those that don't. Click below to get the power of private cloud server working for your business!